Item is a composite photograph of the Dalhousie University Faculty of Law class of 1926. The photograph consists of portraits of F. W. Bissett; A. B. Morton; C. N. Bissett; A. R. Hull; R. J. Byrne; R. C. Wilson; G. J.. Ross; P. J. Lewis; C. R. Coughlan; G. E. Mills; M. M. McIntyre; D. McInnes; G. O. Ryte; C. D. Parks; J. W. Longley; H. E. Read; S. E. Smith; N. D. Blanchard; Bertrand Joseph Spencer Pitt (B.J.S. Pitt); W. E. Thompson; Cleave Mc. 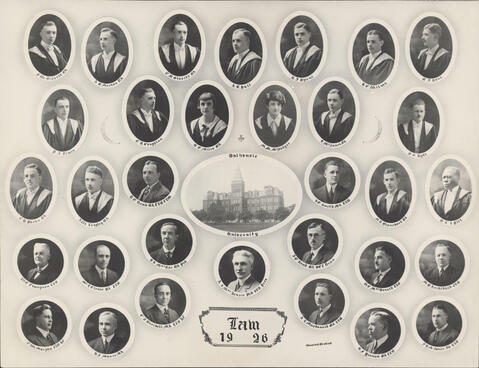 I.; D. A. MacRae; A. S. MacKenzie (President); J. E. Read (Dean); W. C. MacDonald; M. B. Archibald; T. W. Murphy; H. F. Munro; C. J. Burchell; A. I. MacDonald; R. F. Yeoman; and F. D. M. Jones arranged around a photograph of the Forrest Building. Photograph has remnants of glue on the back.